Prices for domestic US shipping only. This mug by artist Crazy Al takes you back to the Molokai Bar in the great Mai-Kai. When you don't have 3 friends to share a large Mystery Drink, we have produced a small version! Swanky designed this after the original 1959 Mystery Bowl from the Mai-Kai. It is correct even with the inner ring for the ice volcano! This 5 piece mold is as complicated to make as the large version, but easier to handle. Souvenir size! 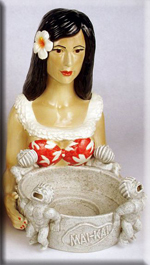 She is an icon of the Tiki world! The Mystery Girl was created at the Mai-Kai. The Mystery Girl Bowl was created by Swanky. As a tribute, he designed the mug years ago and it has become reality today! Recall your times at this Tiki heaven each time you look at this gorgeous maiden. Each one is made by hand by Kristina. Numbered and extremely limited. Email to get on the waiting list for this piece of the Mai-Kai Memories Series!.